Fill out our simple form and get quotes from local chocolate fountain suppliers. Chocolate fountains are a popular choice for weddings, celebrations and private parties. Usually positioned on a table as a centrepiece, surrounded by sweets, marshmallows and fruits, you can dip your chosen treat in chocolate, fondue style. Our chocolate fountain hire suppliers are listed here, so what are you waiting for? Whatever the size of your event, whether it be for a Private Event, Wedding or Corporate Event; just let us know and we will tailor a chocolate fountain package for you! Delicious Belgian chocolate in our 7 tier chocolate fountain accompanied with led light box and staff to manned for the duration, with the dips of your choice. Our 5 tier fountain is available with a few different prices to accommodate any size party / event!! Our chocolate fountain sits on an LED base with a selection of dips to be to taste the flowing delicious chocolate. Based in Hertfordshire we cover all surrounding areas. We provide beautifully decorated chocolate fountains for all occasions from 5 to 500+ using luxury and delicious Belgian chocolate. Ideal for wedding receptions, birthday bashes or smaller celebrations a chocolate fountain will keep the children and the big kids happy! They can be dropped off at your home or venue, set up and cleared away again, hassle free. Try milk chocolate, dark chocolate, white chocolate or even pink chocolate, your chocolate fountain can be made personal to the host or the party. A fantastic centrepiece, indulge in this delicious option perfect for all chocoholics! 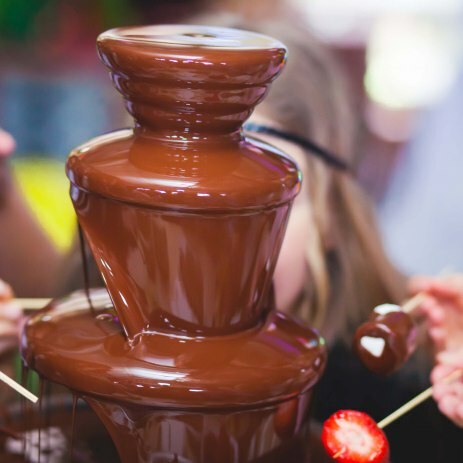 For chocolate fountain hire prices and more details about what the suppliers offer, simply submit a quote request form to chocolate fountain suppliers in your local area.